As an emerging crop with only a very recent history of cultivation and domestication, there are tremendous opportunities to improve the efficiency, reliability, sustainability, and economics of shrub willow cropping systems. We are conducting the following applied research projects aimed at expanding the options and improving the sustainability of shrub willow crop management. The current commercial practice is to plant shrub willow bioenergy crops in a double-row spacing configuration with plants every 24 inches (0.61 m) within rows that are 30 inches (0.76 m) apart in each double-row. The double-rows are separated by a 5 foot (1.52 m) alley, resulting in a stand density of 5,808 plants per acre (14,351 plants per hectare). 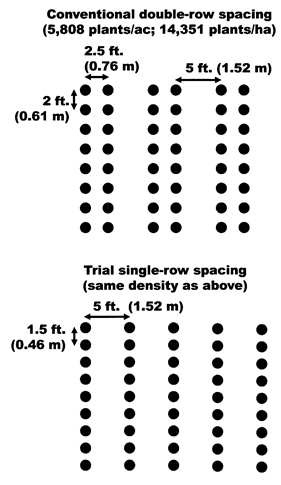 In 2009, we planted a trial with 10 varieties to compare the yields, growth habit, weed management, and harvesting efficiency of a single-row spacing arrangement (18 inches (0.46 m) between plants in rows spaced 5 feet (1.52 m) apart) that results in the same stand density as the conventional double-row spacing (see Figure). This trial was coppiced at the end of the 2009 growing season and will be harvested at the end of the 2012 season. 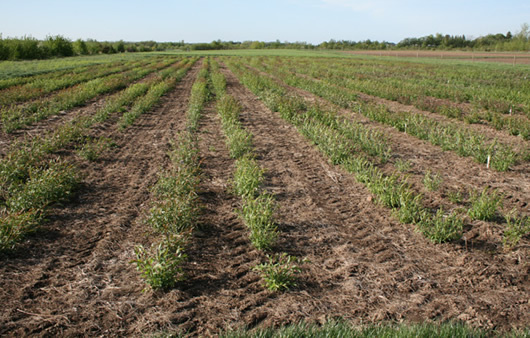 Successful establishment of plantations of shrub willow bioenergy crops requires effective weed management, especially during the first two growing seasons. While a number of pre-emergence and post-emergence herbicides have been regularly used in academic research trials and demonstration fields, there are no commercial products labeled in the United States specifically for use on shrub willow bioenergy crops. We have initiated trials to identify products that can serve in the management of weeds in commercial shrub willow fields, based on low phytotoxicity and efficacy in the control of typical problem weeds in willow plantings. In the spring 2010, field trials were established on three sites: at the New York State Agricultural Experiment Station in Geneva, NY by Larry Smart’s group; Fredonia, NY by Dennis Rak of Double A Willow and Rick Dunst of the Cornell Lake Erie Research and Extension Lab; and in Escanaba, MI by Ray Miller of the Forest Biomass Innovation Center of Michigan State University. Using the same experimental design for each trial, seven commercial willow varieties in six-plant plots were planted in four replicate blocks at each site. Eight individual pre-emergence herbicides were applied at two rates each: a typical labeled rate for each product and double that rate. Two additional treatments were mixtures of two different pre-emergence herbicides. Approximately 30 d after planting, five post-emergence herbicides were applied at two rates each. Mid-season and end-of-season stem growth measurements were collected that together with a second year of trial results can be submitted for supplemental labeling of desirable products for use in commercial shrub willow bioenergy crops. In addition to trials testing herbicides for weed management, we are also testing the efficacy of planting cover crops to suppress weed growth during the establishment year. In 2010, we established a pilot trial in Geneva, NY with one willow variety (Salix sachalinensis x S. miyabeana ‘Sherburne’) to compare efficacy of weed suppression and potential for competition with willow of two cover crops, Dutch white clover (Trifolium repens L.) and buckwheat (Fagopyrum esculentum), relative to plots sprayed with a mix of pre-emergence herbicides (Dual Magnum and Prowl H2O). We will assess the growth and percent weed cover in these treatments relative to hand weeded and untouched plots. For more information on cropping systems, contact Larry Smart.